Two new construction townhouse style residences crafted with top of the line materials and meticulous attention to detail, all in a farmhouse style. Enter into spacious, open floorplan living and dining spaces with 9.5’ ceilings, oversized windows and gorgeous millwork. The kitchens are huge, featuring two 15’ walls of cabinetry and appliances, anchored by a center island with seating for 4. The painted maple inset cabinetry has beautiful shaker details, and is painted in hues of blue and dove white. The countertops are quartz with marble veining, and the professional appliances are by Thermador. There is also a half bath on this floor. Upstairs, each townhouse has three bedrooms and two baths, including a luxurious master en-suite with Jeffrey Lewis limestone tile, double vanity sinks, inset cabinetry and large showers with frameless glass door. The second bathroom will be clad in honed Carrara marble. The lower level offers a 4th bedroom option, a recreation space as well as a large storage room. There is also a full staircase leading to a large attic for additional storage. Flooring throughout will be wide plank hardwood and together with a shiplap entry staircase and beadboard ceilings, give the home its farmhouse flair. Fixtures, lighting and hardware are from the likes of Kohler, Restoration Hardware and Emtek. Interior doors are shaker style in 1 and 5 panel varieties. Each closet is to be outfitted in a custom closet system. Exterior materials require little maintenance and include cement fiber siding, Boral trim and Mathews Brothers windows. 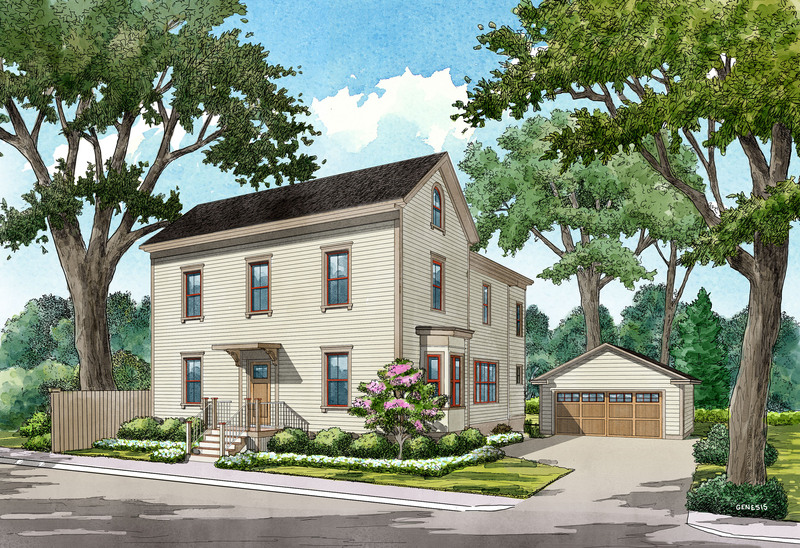 Custom exterior features include shop-designed under-sill corbels and arched top gable end windows. Landscaping and hardscaping will be tastefully executed, and each townhouse has a fenced yard area. Each townhouse also comes with two parking spaces, one garage and one surface. HVAC offers two zones of heating and air conditioning. Energy efficient features include spray foam insulation, stretch energy code compliance, tankless hot water and 5” LED can lighting throughout. 1 year builders warranty. +/- 2500 sq/ft each.